Hi guys. Yes I'm back, dunno for how long. Decided to test the water with this one. Personally I'm not sure about the burn effect, I put it in solely because I felt that yet another banish-mill effect would be redundant at this point given how much utility PB's already have in that area. I feel like the spell effect is a little bit OP but I feel like its acceptable thanks to the restriction. 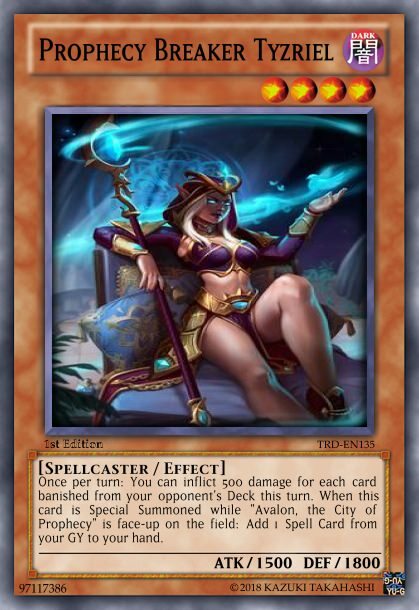 Spellcaster/Effect: Once per turn: You can inflict 500 damage for each card banished from your opponent's Deck this turn. When this card is Special Summoned while "Avalon, the City of Prophecy" is face-up on the field: Add 1 Spell Card from your GY to your hand.